One who used to have a pair of these in the mid-80's say that these sneakers are just as good as they were before. Numerous satisfied consumers would recommend these trainers. According to one purchaser, the ZX 280 SPZL looks better in person than in pictures. A couple of users find this rare edition sneaker beautifully-made and well-crafted. Many are fans of the throwback style as it can capture both the Spezial and the ZX range essence. Few of the reviewers comment on how comfortable the Adidas ZX 280 SPZL is. Some of the commenters appreciate the colorway of the sneakers. One finds the price of these sneakers a bit too high. Although the silhouette of the shoe is praise-worthy, the yellow Three Stripes does not appeal to one tester. A purchaser mentioned that there are glue markings that are visible on the suede upper. There is no stopping a designer from taking a look back to the archives and becoming inspired in recreating classic designs and making it adapt to modernity. The ZX 280 SPZL, an additional piece to Gary Aspden’s creations, features a rave-era inspired shoe which the combines iconic SPZL and ZX series. The combination of two legends results into a unique sneaker that is modern yet delivers a major retro appeal. Although the price may be a tad steep at $130, users can go back to the Second Summer of Love through a beautifully-crafted shoe. Extremely popular sneakers because of their price range, versatility when it comes to style, and freedom of movement. Almost everyone is guaranteed to have low-top sneakers in their shoe rotation. Mid-top sneakers extend toward the ankle for a little more support and hold. These lie somewhere in the middle between low-top and high-top sneakers in terms of usage and popularity. Sneakers with collars that go above the ankles for optimal hold and support are some of the most sought-after models in lifestyle shoes. Most of these shoes take their roots from basketball and have easily or fashionably crossed to mainstream wear. Regardless of cut, it's always good to start with sneakers that can be worn for the daily grind, also called as "beaters" by some, as these are usually cheaper, easy to clean, and still gives that lifestyle "edge" before going for those wallet-thinning models. Sneakers dominantly take their heritage from running, basketball, skate, tennis, training, hiking, and football. Still retaining a few of their performance-based technologies, these sneakers have transcended their respective niches and have successfully and popularly transformed themselves as staples of fashion footwear. Sneakers designed for a laidback, "cool" vibe that is built for lifestyle wear right from the get-go. Brands are now blending elements of performance and casual appeal in basically every sneaker. One can hardly go wrong with a sports-inspired sneaker or a simple casual shoe. A masterful team-up between two or more entities, usually between brands and artists, pro-athletes, designers, and boutique labels. Limited Releases are very popular and are normally sold out in just hours or minutes upon release despite the hefty price tag. Collaborative works for General Release regularly come with a decent price tag, but can sometimes cost an arm and a leg because of hype, social media anticipation, or marketing strategy. Kanye's collab with Adidas is one such example. Shoes sharing the same inspiration, history, materials, or technologies are routinely assembled under one compilation for the convenience of those who may wish to categorize or label their own collection as such. The classic collections like the Adidas Originals, Air Max 1, Air Force 1, new balance classic sneakers, and the Classic Leather head the pack of frequently asked about collections. The Adidas ZX 280 SPZL is a tribute to the iconic silhouette previously released called Spezial. Initially launched in 1979, the sneaker was marketed to be a high-end handball shoe. The shoe was able to fill in the high demand for the sport and address the heavy friction and sharp movement of the players. Because of the suede upper, the Spezial is often confused for the Gazelle. Because of its minimal appearance, matched with ample cushioning, reinforced heel panel, and gum outsole, users find it fashionable casual footwear during the 80s. Designer Gary Aspden, took inspiration from the Manchester circa 88-89, when the mentioned sneaker was a party staple. The whole line he has created features the silhouette the SPZL recalibrated into the rave scene. With the comeback of the Spezial, its inclusion in the ZX family, another retro shape, gives a different twist and an interesting update on the classic. As part of the Spring/Summer 2018 collection, Adidas creative consultant Gary Aspden digs more in-depth on the brand's history. One the second half of his line, he took inspiration from the United Kingdom's acid house music and rave parties called the "Second Summer of Love." From going down the memory lane, Aspden was able to produce a tangible throwback that gives nostalgia, combining his experiences on summers spent in Ibiza circa '88 and '89. Because of this, the sneaker exudes the vibe of being the ideal shoe for all-night ravers. 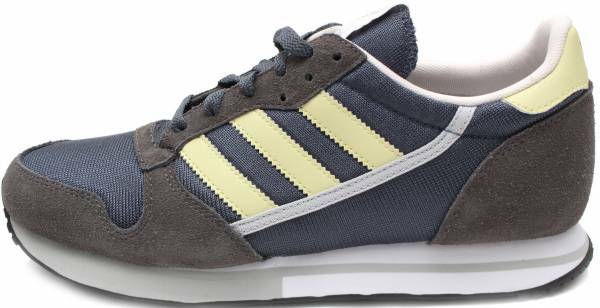 The Adidas ZX 280 SPZL is a men's sneaker that is available in men's sizes ranging from 5-12. Women wishing to avail of this style can go 1.5 sizes down their usual for the ideal fit. Based on reviews, these sneakers fit a bit small. Because of this, it is recommended to go a half or a full size up. The suede reinforcement on the lace-up closure allows users to adjust the tightness of the sneaker to their liking. They say when things aren't broken, don't fix it. Based on the updates done on the Adidas Gazelle, this seems to be the brand's mantra. The ZX 280 SPZL sports not only a vintage look but a retro-inspired EVA midsole, which may seem a bit outdated especially with the sea of footwear technologies, but still good enough to provide lightweight cushioning for everyday wear. The upper of this shoe is composed of premium pigskin suede with textile quarter panels and underlays. The label on the tongue sports a replica of the vintage Adidas logo. These sneakers have a Spezial-branded sock liner which boosts the comfort when worn.